Last visited by Zerver on Dec 11 98The City of Tar Valon is located on an island that is located South of Britain, and North of Trinsic. 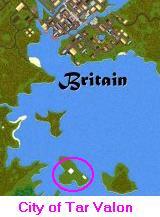 It is the island with two white buildings on it. The smaller of the two buildings also contains an entrance to the New Lands, so this is a good place to visit either before or after a T2A expedition. The entrance is in guard zone, so Reds probably should not use it. The city has 3 main public buildings, the Keep, the Tavern, and the Market. Reviews of all three can be found on their own pages. In addition, the city has a healder’s shack with training dummies in it, a Tailor shop with loom, and a wonderful park with a fountain and flowers.